Looking for more than a standard on-hold message? The most effective way to promote, inform, and motivate your callers is our fully customized message. Make the best use of your callers time. Educate them about your products, services, or whatever you think is relevant. Corky's warm, confident, intelligent voice is the perfect vehicle for soothing and informing your clients. Does your business information change frequently? No problem. We can craft a schedule to update your messages as often or as seldom as you need. The more frequently you change your message, the more you save on each message. * Fully customized includes writing, voice and production with licensed music. Do you have other ideas or needs? We can make it happen! Buy from us and receive 20% off the price of our customized programs. It doesn't get easier. USB drive, thumb drive, pen drive ... call it what you want, its simple. Can you drag and drop a file? Thats all you need to know. What makes the ProDigital better than other on-hold players? The USB drive. Other systems use cassettes, CDs, flash cards, or USB cables. That leaves you messing around with card to computer compatibility issues, cables, or staring at your mailbox for a few days while you wait for a CD or tape to arrive. With the Prodigital PD-USB60 all you need is a USB port on your computer. Download your message, then drag and drop. Its that easy. Screen display. If you'd like to store more than one message and change them from time to time, you simply look at the screen to select the message. Other systems make you do things like “Press the button three times then count how many times the green light blinks!” ... VERY confusing. Quality. If you could hold an average on-hold player in one hand and a PD-USB60 in the other you'll immediately get the picture. This thing is built like a tank! Price. You can pay more but you won't get more. You can also pay less ... in that case you will indeed get less. The ProDigital PD-USB60 is a great value. 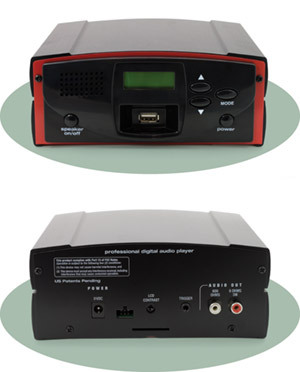 Buy your Prodigital machine from the Coreson Company and you'll save 20% off the price of your message! The Coreson Company and Prodigital: It doesn't get easier. It doesn't get any better. Have IVR needs? We'll gladly provide a quote. Please Contact Us. Copyright © 1996 to the present, The Coreson Company, Inc. All rights reserved.